Paul Barden Roses: It only took a year. 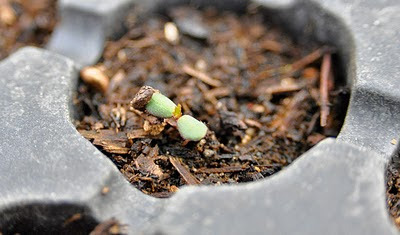 Paul I got pretty good germination from R. glauca by changing the temperature back and forth every two to three weeks. Oh if you are going to select them by foliage color to grow on make sure they are out side for a while. I know under lights the foliage color did not develop and I think under glass the same would be true, but under sun light the foliage color began to show up. Would singing 'Happy Birthday' be appropriate? Congratulations on the seedling and on your patience, Paul. This reminds me of eternal hope..never give up!! !